OCEAN BEACH, CA. OB Rag – the blog – announces that we have scanned in another original OB Rag – the paper. Go here for that issue. Volume 1, No. 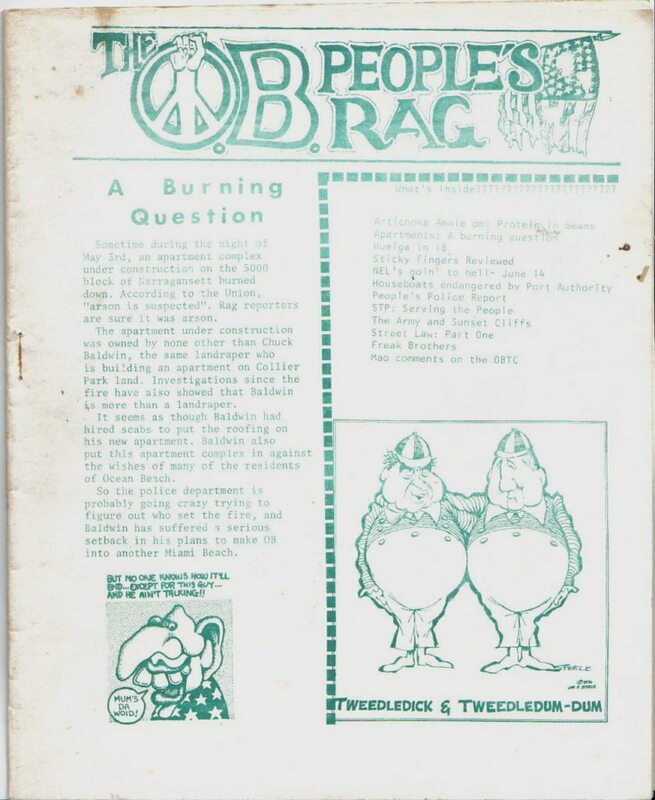 14, the issue that covered the community from late May to early June 1971, represented the second Rag in a series published by a new staff that had taken up the reins of Ocean Beach’s feisty and raw “underground” newspaper. The original staff had fallen to the wayside in the aftermath of the infamous Collier Park Riot (March 28, 1971) and a dedicated young crowd made up of local students, alternative reporters and antiwar activists took on the tasks of keeping the paper alive. This issue reflected the militant and radical politics as well as the inexperience and enthusiasm of the alternative journalists that steered it through the remainder of 1971, definitely a turmultous period for OB’s underground. This issue, had quirks; for one, it didn’t have a volume or issue number, nor a date. We had to determine its number by careful calculations of the various printing dates, etc.